At this rate, the New York Knicks might be able to knock off Iona to win the Metro Atlantic Athletic Conference. Today, the team continued its quest to form the best backcourt in college basketball by acquiring Steve Francis from Orlando for Penny Hardaway and Trevor Ariza. Right now, the Knicks clearly resemble a mid-major college team that has talented guards who can shoot and run but they are incapable of recruiting big men. They are almost like the Gonzaga teams from few years ago. It’s unbelievable. I understand that Larry Brown was the one who wanted Francis but Isiah Thomas reminds me of the fantasy league GM who clearly has no idea what he’s doing. Thomas wants to build a team of less-talented clones of himself and still hasn’t grasped the concept of the salary cap. It’s not even like the backcourt is exciting now. 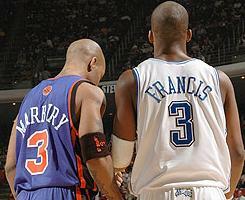 Stephon Marbury is an immensely gifted player but he’s a poor man’s version of Allen Iverson. He needs to have a true point guard to make him a better player. Francis is not that player. He’s just a poor man’s version of Marbury. We’re talking about a pretty poor man here. They would have been better off getting a point guard from the developmental league. Why not sign former New York City star Andre Barrett? I guess cost effective part-time solutions are a bad idea. By Thursday afternoon, they might even get worse. Rumors are that they are trying to trade for Darius Miles in an effort to have the least educated team in the league as well as the least talented. Posted by Dan McGowan at 2/22/2006 hype it up! Ha, I like the comparison to a Mid-Major. I quoted your post in my write-up about the trade. And I think it's safe to say that Isiah is hands down the worst GM in the NBA. Not even Rob Babcock or Elgin Baylor (once called a "veteran of the lottery process") could have so effectively run a team into the ground for not only the present but multiple years into the future as effectively as Isiah. Dan, I have to tell you, I can'te believe just how brutal the Knicks are. Since December 6, the Knicks have lost by 20 or more at home four times. The only other two teams to get beaten on their own court by 20 or more more than once in that time are the Clippers and the T-Wolves, twice each.